Without my family’s annual winter beach vacation, I have been slacking off on – what I affectionately refer to as – routine maintenance. Part of it has been a time thing, part is a money thing (usually it’s about $50 a pop for a professional job), and part is just plain laziness. But in the last few days, it’s started to get the better of me. My go-to salon for waxing is the Red Door Salon and Spa. They use a special kind of wax that doesn’t hurt as much (to me at least), so I’ve been a devotee for years. Plus, there is one near my office, so it’s super easy to pop out on my lunch break to take care of business. But lately I have been really busy (and poor and lazy), so I haven’t been able to get over there. 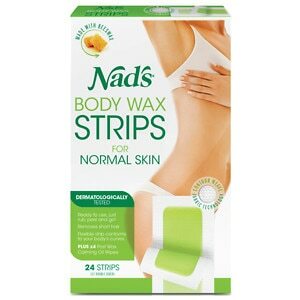 So, as I was perusing the aisles of Target this past weekend, I saw these wax strips and decided to give them a try (for a grand total of $6.99). I suppose I was feeling extra Discountess-like that day. A total savings of $43 – not bad, right? 1. It hurts. Of course, it hurts when a professional does it too, but something about the element of surprise when someone else does it makes it an easier pill to swallow. 2. It takes a while. What is normally a 15 minute blip in my lunch break took me 25 minutes to get it right (insert more pain here). Slow is definitely not the way to get this done. 3. Without a mirror and some serious acrobatics, you can’t entirely see what you’re doing. This is not a time for guesswork. Trust me. One misstep, and you guessed it, more pain. 4. Did I mention that you can seriously hurt yourself? Let’s just say, I managed to give myself some sort of bruise in the process. Enough. Said. So for you Discountess readers who are looking to cut costs, my recommendation would be–cut elsewhere. This is an experience that even many professionals screw up, and I was no exception. I was too big for my britches. I failed, and I have a bruise to prove it. Hilarious. I do not go to a professional, nor do I do this at home, instead relying on old technology called a razor and shaving cream. But I imagine that this would not be an area where I would scrimp, just like I won’t be using a Groupon to save a few bucks on a facial.